Designed to observe neutrinos, IceCube consists of 5,160 digital sensors, which are attached to vertical strings and frozen into 86 boreholes, one of which is seen here. Photo courtesy of Mark Krasberg, IceCube/NSF. What could be more daunting than searching for an invisible particle — one so elusive that physicists had no evidence of its existence until 1956? This is just the kind of challenge that Ohio State astrophysicists Jim Beatty and Amy Connolly find irresistible. They are not alone — teams of international researchers hunt relentlessly for these high-energy neutrinos to extract clues that will tell us more about the universe and ourselves. Neutrinos are tiny subatomic particles that are nearly massless and travel almost at the speed of light. Most neutrinos have been around for billions of years, shortly after the birth of the universe, and trillions pass through our bodies every second. Unlike other particles, neutrinos carry no electrical charge and interact only weakly with other particles, meaning they can travel the cosmos unabsorbed from the high-energy collisions that produced them. If they can be observed directly, the hope is that they will unlock some of the greatest mysteries of our universe. Today, neutrino hunters rely on detectors located in Antarctica — the coldest, most remote place on Earth and the optimal site for tracking neutrinos. Beatty, a professor of physics and astronomy, has tracked this tiny particle for three decades. Connolly, an associate professor of physics, has been dedicated to this pursuit since the early 2000s, when she started as a postdoctoral researcher at the University of California, Los Angeles. 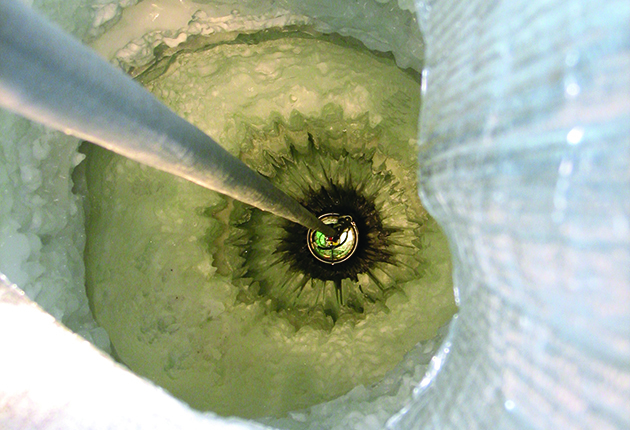 Both Beatty and Connolly work on the NASA-funded Antarctic Impulsive Transient Antenna (ANITA) experiment, designed to study ultra-high-energy cosmic neutrinos by detecting radio pulses emitted from interactions with the Antarctic ice sheet via an array of radio antennas suspended from a helium balloon floating above the continent. Beatty also works with the world’s largest neutrino detector, the IceCube Neutrino Observatory, an underground telescope with thousands of sensors distributed over a cubic-kilometer block under Antarctic ice. Spherical optical sensors, called digital optical modules, are deployed on “strings” about 2,500 meters deep within the ice. Each sends digital data to a counting house on the surface. “IceCube’s telescope is a powerful tool in the search for dark matter; it could reveal physical processes associated with the enigmatic origin of the highest-energy particles in nature,” Beatty said. According to Beatty, when neutrinos interact with atoms inside deep Antarctic ice, they can give off puffs of energy. As neutrinos pass through the ice and interact, they produce charged particles, which give off light while traveling through ice at near-lightspeed. The light leaves a ring-like pattern that can be observed by researchers, enabling them to infer information from the neutrino. Connolly searches for these ghost particles using this method. She examines data from ANITA and the Askaryan Radio Array (ARA), deployed deep in the ice near the South Pole. Additionally, Connolly and her colleagues are working to develop a prototype of a proposed “super-ANITA,” called EVA (Exa Volt Antenna), that would become the world’s largest airborne telescope. The neutrinos that Connolly and her team are looking for come from greater distances and are of much higher energy than any extraterrestrial neutrinos seen before. They come from the very particle collisions that created this universe and everything in it, and they hold great promise for understanding our place in it.